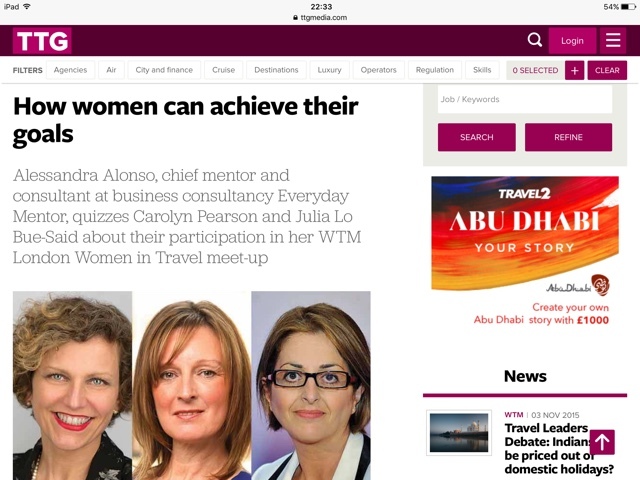 If you have read my earlier blog from last week you know that I have been recently running a Women in Travel platform at travel trade fair World Travel Market. The first of my two debates was dedicated to the big R word: R.E.S.I.L.I.E.N.C.E. Or - as I call it - the art of bouncing back. As somebody said, it is not about how many times you win, but how many times you are able to pick yourself up after you've fallen. To discuss the topic and provide some really genuine insights into the importance of resilience there were 4 leading ladies, each at a different stage in the development of their business, start-up, growing and mature. Although from different backgrounds in the industry at large, all four ladies talked emphatically about the importance of being resilient both in your business and personal life. Whether you are an entrepreneur or not, the following insights into resilience will hopefully help you with building few more ammunitions for when challenges arise and you need to find that extra element of strength in you. Resilience increases when challenges can be shared. Building a business or focussing on delivering a top performance takes a lot of energy out of any individual and besides, it can be a lonely business especially right at the outset. All my ladies stressed the importance of being out there and making sure you network and mix with other like minded professional and entrepreneurs on a regular basis to avoid the risk of becoming anxious and even depressed. Finding groups to network and sharing challenges or celebrate success helps us keep loneliness and self doubt at bay even though we might be building a business from scratch and from our kitchen table. Resilience requires courage and self belief. At the debate speaker Daniela Wagner shared some very personal business experience and spoke openly about the need to trust your instinct and follow your guts or intuition when the world seems to collapse around you. Ultimately you know what needs to be done, you know what is right and must find the courage to do it even though it may appear scary or out of your comfort zone.